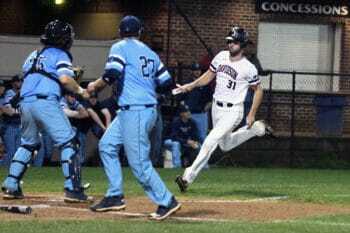 The Wildcats hosted the Rhode Island Rams for a 3-game stand over the weekend. The ‘Cats won the series 2 -1. 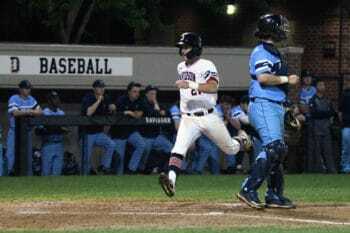 Davidson’s return to Atlantic 10 Conference play this weekend resulted in a series win over the Rhode Island Rams. The Wildcats secured that with a 10-2 victory in the first half of Sunday’s doubleheader at Wilson Field, which followed the 7-2 win from Saturday night. The series concluded with a 4-0 Rhode Island win Sunday afternoon. Now, Davidson is 16-15 overall and 6-3 in the A-10. Davidson had everything working in Sunday’s first game. The Wildcats hit four home runs, matching their season high from Feb. 15 (Towson) and March 24 (La Salle). And right-hander Josh Hudson (3-1) threw 6.2 innings and struck out three, while allowing two earned runs, five hits and walking two. He had run support early and often. Alex Mardiney hit a two-run home run in the first. Then Brett Centracchio and Eric Jones hit solo shots in the second and sixth, respectively. Frey went deep with a two-run shot in the seventh. Alex Fedje-Johnson and Max Bazin added RBI-singles in that four-run seventh, and Fedje-Johnson finished off the Rams with a two-run double in the eighth. Alex Mardiney crosses home for a Wildcat run. In Sunday’s second game, Rhode Island right-hander Justin Cherry threw 7.2 innings and allowed only four hits, while striking out 11 and walking one. 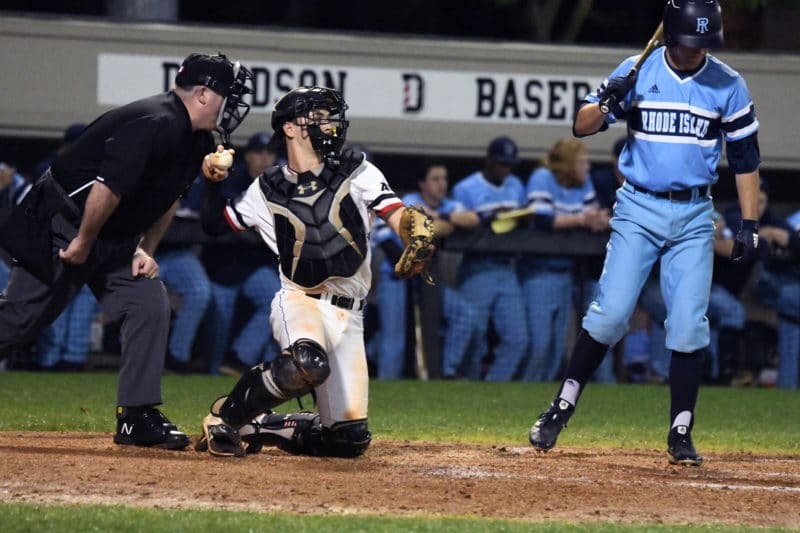 The Wildcats’ best scoring opportunity came in the eighth inning, with the Rams leading 3-0. Frey led off with a double, but was stranded there. In his first start, freshman right-hander Alex Fenton threw 3.2 innings and allowed two earned runs and four hits. He struck out two and walked two. Dan Spear came on for his longest outing of the year and threw the next five frames, also allowing two earned runs and four hits. He struck out six and walked one.